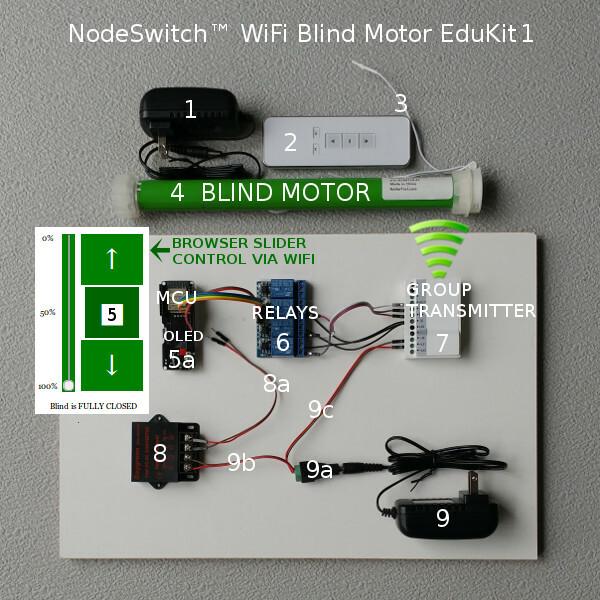 We developed this educational kit so that you (or a geek in your family) can learn about this advanced system, with a very practical result of being able to control your blinds with any web enabled device (phone, tablet, laptop, etc). There is no soldering required for this kit (we pre-solder the headers). You can use any browser in your home to adjust the slider and communicate via WiFi with the ESP32 microcontroller. This controls the relay module which triggers the group transmitter to send out the radio control signals to the blind motor. 1. POWER SUPPLY: A 12V DC power supply (2 amp) provides power for the blind motor. Standby current of the motor is very low, about 70 microamps. The battery motor kit has an AC charger instead of this power supply. 2. REMOTE CONTROL: Our standard 5 ch remote can reach motors mounted anywhere in a typical home; the radio signal will pass easily through most walls. This unit can be used to set the travel limits of 5 different motors. 3. RECEIVING ANTENNA: The antenna wire picks up the remote control signal from the 5 ch remote control or the group transmitter. 4. BLIND MOTOR: The radio motor can store 20 different channels, so you can have multiple hand held or wall mounted remotes. It also comes with mounting brackets; for more info, please see this comparison table of blind motors. It slides into the tube of a roller shade, and you can make it yourself, or order pre-cut fabricated shades mounted on proper tubing from our custom shade division. 5. BROWSER CONTROL: The ESP32 microcontroller has powerful capabilities, including the ability to act as a web server, with browser control of the system. 5a. MICROCONTROLLER BOARD: The ESP32 microcontroller is mounted on a motherboard, with a built-in OLED display that is very handy for displaying system status and error messages that you will learn how to control. This board also has a standard plug and charging circuitry for a 3.7v lithium backup battery (not supplied). We have installed special headers that accept plug-in dupont wire harnesses (provided), so there is no soldering required. These special headers also have legs protruding from the bottom, so you can use a breadboard, if you prefer. We have also pre-loaded it with functional software, so you can use it out of the box, but it can be re-programmed via WiFi, or with a serial USB to micro cable (see Part 2 in this article series). 6. 4 CH RELAY MODULE: The ESP32 controls this four channel relay module to act as a trigger for the 3 actions of the group transmitter (OPEN/STOP/CLOSE). We provide a proper Dupont style of wiring harness that is used to connect the 3 data pins, ground pins, and 5 volt power to the relay module. It uses one relay for each of the 3 actions, so there is one spare relay that can turn something else on (LED array?). The relays can handle up to 10 amps of current, which is much more than required for the group transmitter. 7. GROUP TRANSMITTER: Our group transmitter operates at 433 MHz, with a digital radio protocol that penetrates most walls. It is a single channel unit that can control an unlimited number of motors simultaneously. The dupont wiring harness (provided) connects it to the relay module. 12v power is supplied directly from the power supply (9c). 8. DC CONVERTER: This device is a buck converter that provides 5V power (for the MCU board and relay module) from the 12V power supply. It has a maximum output of 3 amps, which leaves a lot of headroom. 8a. 5V DC FEED: If you use a serial cable to program the MCU board, it will supply 5V power too. 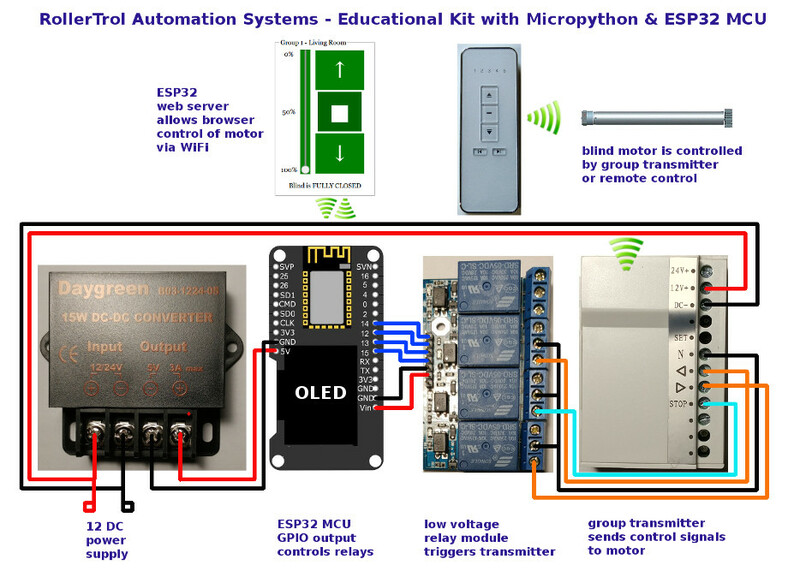 But once the device programming is over, you may want to mount the components in a closet, so this line can be used to power the MCU and relay boards. 9. 12V DC FEED: This 2 amp unit supplies power to the buck converter (9b) and group transmitter (9c) via the screw terminal adapter (9a) provided with the power supply.